Factory Ducati rider forms strong base on day one of testing. 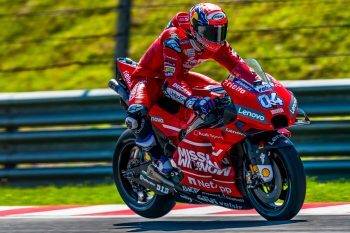 Andrea Dovizioso has praised Mission Winnow Ducati Team’s Michele Pirro for his assistance in developing the Desmosedici GP19 throughout the off-season, which saw the regular test pilot sample a number of new components. The Italian put Pirro’s work to use yesterday on day one of Sepang’s official three-day MotoGP test, forming a strong base that shows signs of promise. Dovizioso was eighth fastest in the mixed weather conditions, laying down a best-lap of 2m0.197s, positioning himself 0.576s off pace-setter and reigning world champion Marc Marquez (Repsol Honda Team). “Today has been really positive because we found the track in good conditions already and the weather stayed dry,” said Dovizioso. “We made some comparisons but we haven’t found substantial differences yet so we need to make more evaluations in the following days. Testing resumes today at the Malaysian circuit, where the MotoGP World Championship contingent will continue to finalise its latest developments for the season ahead.